Pure Cigs is one of the most affordable e cigs options on the market. It’s nice to see a brand that doesn’t make you choose price over value. It is preferred by many e cigs smokers today. Pure Cigs is a brand that at first blush looks a great deal like Blu Cigs. However, even though the logo and design are similar, a closer look reveals that there are some important differences. If you’re just starting out with electronic cigarettes, for example, you’re sure to appreciate that Pure Cigs is one of the most affordable options on the market. For such a low price, though, Pure Cigs really delivers on flavour and quality. When you first pick up a Pure Cigs e-cigarette, one of the first things you notice is that it is made from quality materials. Frankly, this is surprising given the price range of these products. Yet, it is obvious that the company does not cut corners while slashing prices. This electronic cigarette feels solid and comfortable in your hand. The weight is well balanced, so you don’t feel as though you’re holding an insubstantial toy or something that is too heavy. One of the nicer features about Pure Cigs e-cigarettes that make them a little different is that they have LED lights that can be personalized with different colours. While various companies do offer LED lights at the ends of their electronic cigarettes, these tend to be one colour. Being able to customize the LED is a cool feature, and being able to choose less obvious colours makes it easier for you to smoke in public without being accused of lighting up an actual cigarette. Pure Cigs come in seven flavours, including tobacco, Virginia tobacco, menthol vanilla, cherry, risqué (caramel tobacco), and a nutty blend. While it’s not a huge selection, each flavour is very powerful and intense. The nutty blend is especially popular with customers. One warning about Pure Cigs electronic cigarettes: the cigarettes really do pack a punch. Both the vapour and the flavour are intense – more so than other brands. If you’re a heavy smoker or like a lot of flavour, this may be perfect for you. However, if you prefer very light cigarettes or very bland flavours, it may be too much. It really is a matter of personal preference. What Makes Pure Cigs Different? 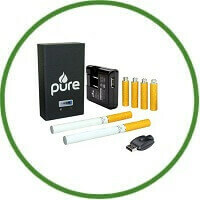 Pure Cigs electronic cigarettes really offer value for your money. A basic starter kit starts at just $17.99 and comes with four cartridges, one battery, and a USB recharger. It has everything you need to get started at a very reasonable price. Even the deluxe kit comes in at under $50. If you’re switching to electronic cigarettes because you want to save some cash, Pure Cigs makes it easy by offering you affordable products that are still high quality. It’s nice to see a brand that doesn’t make you choose price over value. The e-cigarettes certainly don’t wimp out in throat hit or vapour. Pure Cigs XL cartridges pack in more e-liquid than other brands and have two atomizers for more vapour production. These cartridges hold more liquid – up to three times more than other brands – and deliver a very intensive vapour and flavour punch. 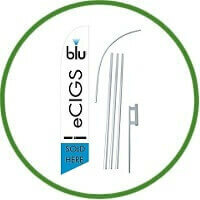 Pure Cigs electronic cigarettes offer a lifetime warranty on many of their products. Like many companies offering a lifetime warranty, though, this warranty comes with multiple restrictions and refers to the lifetime of the product, not of the customer. Nevertheless, replacing a defective product seems to be a relatively simple process. It’s easy to get in touch with the company online, through e-mail, or through a toll-free number. Their 30 day money back warranty is pretty comprehensive and doesn’t have too many restrictions. One downside is that they do charge a 25% restocking fee for returns. This does seem a little high compared with other companies. However, Pure Cigs does generally ship within 24 hours of getting your order, so your product will get to you very quickly. If you’re looking for an affordable entry into electronic cigarettes but don’t want to compromise on quality, Pure Cigs is a solid choice.